Which graphics virtualization technology is right for you? Discrete Device Assignment (DDA) - For the highest performance using one or more GPUs dedicated to a VM providing native GPU driver support inside the VM. The density is low because it is limited by the number of physical GPUs available in the server. Remote FX vGPU - For knowledge worker and high-burst GPU scenarios where multiple VMs leverage one or more GPUs through para-virtualization. This solution provides higher user density per server. 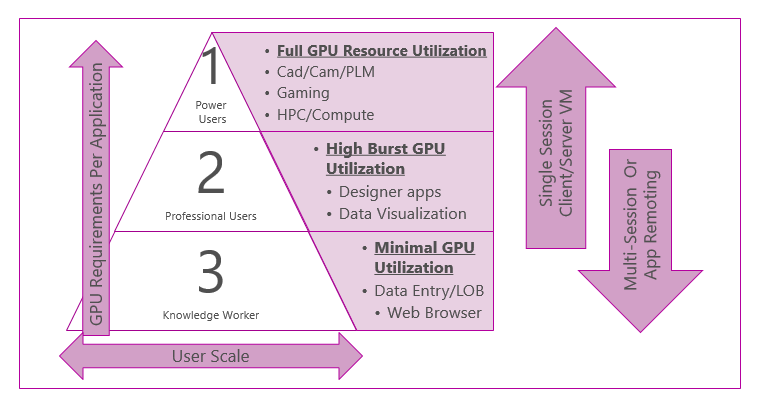 The following illustration shows the graphics virtualization options in Windows Server 2016. Discrete Device Assignment (DDA) is a hardware pass-through solution that provides the best performance, given that the VM has full access to the GPU using the native driver. Your VM user can access the full capabilities of their device as well the device’s native driver. This means the features and capabilities of running the device in a VM mirror running the same device on bare metal. For more information about DDA, check out Plan for deploying Discrete Device Assignment. Support for Generation 2 guest VMs, Windows Server 2016 guest VMs, and Windows Client Hyper-V host. Remote Desktop Session Host is not supported on a Windows Server 2016 guest VM; only 1 session can be hosted per Windows Server 2016 guest VM. Improved application compatibility and stability. VM Connect Enhanced Session Mode, allowing USB and clipboard redirection through VM Connect to a VM that is enabled for RemoteFX vGPU. For more information, check out Set up and configure RemoteFX vGPU for Remote Desktop Services. A general rule of thumb is to use DDA for the best application compatibility since the virtual machine will have direct access to the GPU. If your applications or workloads do not have as strict GPU requirements and you want to server a wider base of users, RemoteFX vGPU might work best for you.